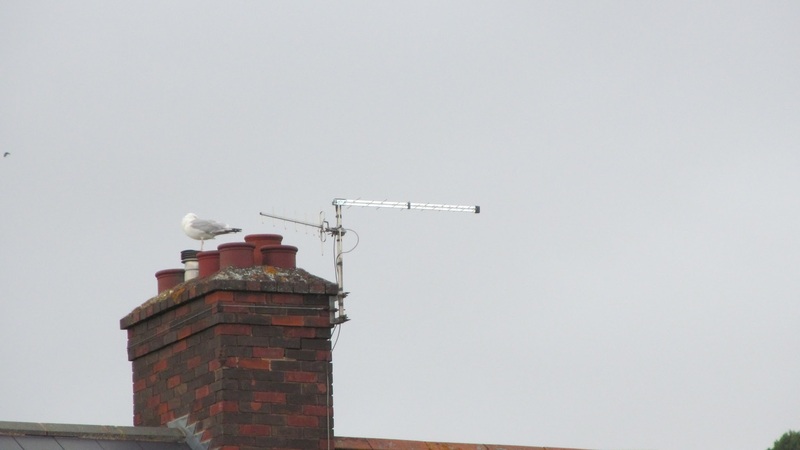 I’ve seen the vans in the area, I won’t mention names but the vans advertise aerial installations for £39 + VAT, this raises one important question for me – what kind of rubbish components are these people installing? A hundred metres of top quality coax cable retails for £60, so they’re definitely using something of lesser quality that will attenuate the signal and become brittle and porous after just a couple of years. I saw an example of this today, one of these vans was parked outside a house where I had provided a quote the previous day. My quote had been for a new top quality aerial, of a type tuned to reject 4G interference, a new bracket and pole and new cable to supply two rooms via a good quality passive splitter. This would have given faultless service for years to come. I decided I would pass by later and see what kind of job this guy had done. Well I was not surprised to see the cheapest of aerials installed on the original bracket and pole and connected to the ( very ) old cable, this cable in itself was part of the reception problem. I don’t know what the people paid for this shocking job but I can guarantee it was more than £39 + VAT. I’ve been round to mop up after this company many times and unfortunately it means the customers have to pay twice. The original bills are nearly always at least £200, they use the same cheap aerials that are totally inadequate around here and never replace brackets or cable. My bills are much less, but that isn’t much comfort to someone that has already paid through the nose for a poor job.